Congratulations! You have been accepted into a graduate nursing program and need to choose your preceptor and site for your clinical experiences. Choosing a qualified preceptor and appropriate clinical site are important factors to ensure your educational and clinical experiences will be successful. According to the ANA (2004), clinical preceptors are integral to the professional development of graduate nursing students . The preceptor should serve as a role model; promote clinical and professional competence, autonomy, and socialization into the graduate nursing role. The preceptor should work with your nursing faculty to provide you with clinical opportunities to advance your current skills. The preceptor should hold a current state-nursing license to practice in the state where the clinical site is located. The Preceptor should hold a graduate degree in Nursing from an (NLNAC) or (CCNE) accredited program and have a minimum of one year of clinical nursing experience. If you choose a Physician to be your preceptor, they should hold a Medical or Osteopathic degree from an accredited program. Keep in mind your experiences will be more advantageous for learning in an area where you have limited practice experience. Inquire about: what have been the preceptors past experiences with nursing education and their role as a preceptor for graduate students? If you will be involved in the selection of patients based on course and personal learning outcomes? The preceptor’s willingness to review your clinical logs and provide ongoing feedback during your clinical experiences. The accessibility of patient records to you during your experience. The location of the site and case mix of patients, to include (age, ratio of acute to chronic disease, mental health, health screening, and ambulatory or inpatient services). Type of clinical practice site: public health, long-term care, acute care or outpatient practice. Will these sites allow you to meet your course outcomes? How you will be supported in the practice site by other clinicians, personnel, patients, families, and the community? Finally, consider previous experiences that have prepared you to be an asset in the clinical setting (i.e. : experiences in management, billing, third-party reimbursement, risk management, quality improvement, disease and personnel management). 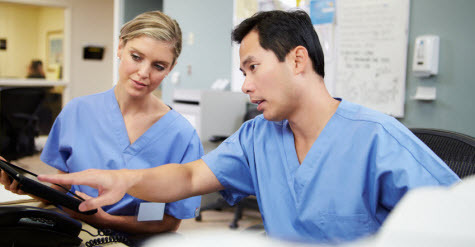 Clinical preceptors and sites are looking for a reciprocal relationship; this provides you with the opportunity to prove yourself during the experiences. It is important to find a clinical site and nursing preceptor that will provide you with the experiences to meet your course and personal learning outcomes. The selection of a clinical preceptor and site will provide you with invaluable experiences to enhance your graduate learning and provide you with the foundation for future employment opportunities.